I have a confession. I’m emotional. Overjoyed, overwhelmed, anxious, content, scared or grateful-I’ve experienced them all and so have you. Emotions make us human. You know who else is emotional? John McEnroe, Andy Murray, Marcelo Rios and Andy Roddick to name a few. Unfortunately we live in a time where raw emotions are overlooked with men and over analyzed with women. Especially in sports. Our latest casualty in emotional shaming is world renowned tennis great Serena Williams. Williams was looking to win her 24th Grand Slam this past Saturday in the US Open Finals. 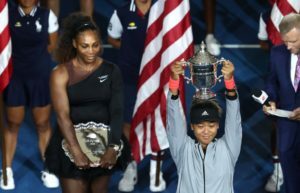 Serena’s opponent, up and coming Naomi Osaka, had long dreamed of a Grand Slam match up with Williams, her longtime idol. Osaka dominated the match early and tested Williams at every level. Hand signals by Serena’s coach during the second set would change everything. 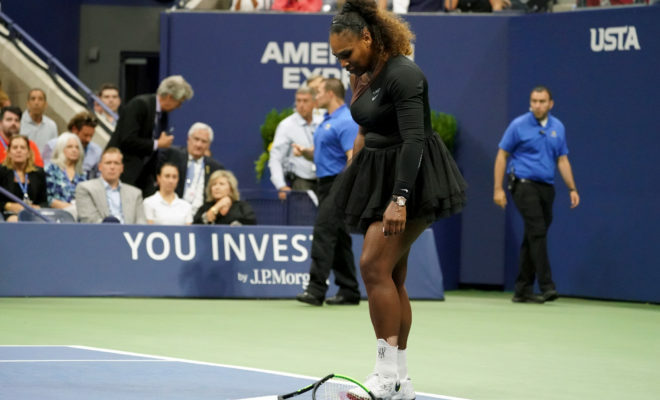 A warning became a point deduction, frustration turned into a destroyed racket and an emotional exchange became a forfeited game that subsequently led to a lost final match for Williams. To say she was upset about how everything went down is an understatement. Let’s take the rules and regulations of the game away for just a minute. Williams, in a tough match where she was getting bested by Osaka, is told by the umpire that she’s cheating because her coach is allegedly giving hand signals from the box. This is like someone saying something really negative about you and then telling you not to take it personally. How else are you supposed to take that? Especially when you’re being accused of doing something you aren’t doing despite what it looks like. Being a professional and maintaining calm is not as easy as it may seem especially when you’re playing for a 24th Grand Slam title. No excuses but I understand in that moment how anyone would be emotionally charged. Time and time again we see male athletes (and men in general) receive praise for being driven, intense or showing strong emotions during competition. Why is it so frowned upon and punishable when women do the same? Labels like “hysterical” “unstable” and “sensitive” plague women for simply expressing their feelings-it’s BS. The double standard of allowing men to be who they are because “boys will be boys” doesn’t cut it anymore if women are not allowed to express themselves in the same manner. I would bet that Serena’s frustrations have been building up over the years. From the multiple random drug tests, to the wardrobe restrictions to the oft racist portrayals of her from news and sports columns here and abroad. Why do we insist that women act perfect in situations that aren’t perfect? I describe it as being asked to eat sh*t politely and it’s something we should take a deeper look at. The lack of acknowledgment is the real issue. If we acknowledge the problem, then we have to change things-mindsets, protocol. We must be willing to admit as a society we expect perfection and model decorum from women no matter what the situation and are willing to give men a pass in similar circumstances. I sincerely hope what went down during and after the US Open finals this weekend gives everyone pause to take a long hard look at how we treat our women athletes and women in general when it comes to emotional displays. 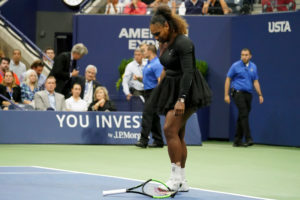 Yes, rules and regulations must be followed and we all recognize that going in but to say that players, especially of Serena’s magnitude should be subjected to harsher penalties than her peers simply for being a woman, a passionate woman, is a disservice to the sport and one of the greatest female athletes to ever play it. We should all be emotional about that. Writer, Ordained Minister, Process Server, Activist, Sports junkie. I exist on a healthy diet of pizza and sarcasm. Have a slight shoe obsession, love the color blue, watching old school cartoons and helping others see the AMAZING in themselves!